locations. It has thousands of vehicles at its disposal, moves thousands of commuters daily, and the best part, it’s FREE! Not only is it free, but it gets people to and from work faster than the typical bus, metro, or train. I think you'll find that it is the most efficient, cost-effective form of commuting in the nation. The system of slugging is quite simple. A car needing additional passengers to meet the required 3- person high occupancy vehicle (HOV) minimum pulls up to one of the known slug lines. The driver usually positions the car so that the slugs are on the passenger side. The driver either displays a sign with the destination or simply lowers the passenger window, to call out the destination, such as "Pentagon," "L’Enfant Plaza," or "14th & New York." The slugs first in line for that particular destination then hop into the car, normally confirming the destination, and off they go. No money is exchanged because of the mutual benefit: the car driver needs riders just as much as the slugs need a ride. Each party needs the other in order to survive. Normally, there is no conversation unless initiated by the driver; usually the only words exchanged are "Thank you" as the driver drops off the slugs at the destination. There doesn’t need to be any discussion about the destination , such as giving directions, because the drop-off points are generally understood. "Rosslyn" means the Metro station in Rosslyn, not at some other point along the way. The "Pentagon" means the curb along Fern Street, not the North Parking Lot. However, there are a few places where the destination drop-off point is not understood; in these cases, the slug must state where he or she wishes to be dropped off. For example, at "Tackett’s Mill," the driver usually asks "New or Old Lot?" because the driver will take you to either. And there is Crystal City, where drivers drop off slugs anywhere between 12th Street and 23rd streets. Later in the book these exceptions are explained in greater detail. When Did Slugging Begin Anyway? It’s hard to believe that slugging has been around in the Northern Virginia and Washington, DC, area for about 40 years! That’s right; slugging debuted in around the 1975 timeframe, shortly after the HOV lanes were opened to carpools and vanpools. Of course, the exact date is uncertain because there really aren’t any official government records that have studied slugging from its infancy. The best source of information has been individual interviews (I interviewed a man who started slugging back in 1982—that’s 20 years of slugging!). The next source has been the numerous newspaper articles written on the subject over the past few years. I’m sure that whatever I determine as the "origin" of slugging, somebody will have a brother-in-law with a Ph.D. in ‘Slug-ology" with undeniable proof that slugging starting years prior….okay, fine. Here is an portion of an email I received in November 2004 from a fellow slug which suggests that slugging was working in 1979. "I'd just like to compliment you on your very interesting web site. I worked in Washington DC as a college student in the late 1970's and I would like to confirm your claim that slugging began prior to the 1989 study. During the summer of 1979, I commuted by bus from my sister's house in Annandale to Naval Research Lab. This trip required riding into downtown DC and catching a cross-town in the morning, then the reverse in the afternoon. On a few occasions I slugged the last leg of the trip home in the afternoon. There was an informal slug line in front of the FBI bldg, which took riders down the Shirley Hwy corridor to various endpoints. When I worked in DC from 1981 to 1985, there were indeed firmly established slug lines at the locations you mention on Keene Mill Road, as well as further out close to George Mason where there was a park&ride. I was in a regular carpool at this time and sometimes our driver picked up a slug or two when a regular rider was absent so that we could still get into the HOV lanes. Sincerely, Mary Ann"
Slugging can trace its roots back to the Arab oil embargo of the 1970’s. During this era, gas prices soared, as it became apparent that the United States was dependent on foreign oil. In an attempt to reduce its dependence, the United States adopted a number of measures to curb gasoline consumption. Speed limits were reduced from 65+ m.p.h. to 55 m.p.h., car manufacturers were told to make cars more efficient, and high occupancy vehicle (HOV) lanes were constructed. These lanes were for vehicles with more than three occupants. The benefit for the government was twofold: reduced gasoline consumption as well as some environmental benefits. "History of HOV in Corridor"
"The Shirley Highway (I-395) component of the I-95/I-395 HOV facility was the first freeway HOV lane in the United States. Opened in 1969, it was originally a bus-only lane. The initial 4.8 mile reversible bus-only lane was extended and expanded into a 9 mile two-lane reversible facility in 1975 when it was opened to carpools and vanpools with four or more occupants (HOV 4+). In January 1989, the HOV requirement was reduced to HOV 3+. Since that time, the HOV facility has been extended further south on I-95 reaching its current limit just south of Route 234 in Dumfries in 1997. 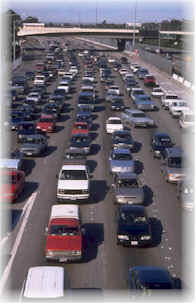 This facility, which carries 14 percent more persons during the morning HOV-restricted period (6:00 to 9:00) than the general purpose lanes and nearly 10 percent more persons during the evening HOV-restricted period (3:30 to 6:00), is recognized by the transportation community as the most successful HOV facility in the United States today." When the HOV lanes on "The Shirley Highway" (I95/I395) were opened to carpools and vanpools in 1975, the first slug lines began to emerged. With these high occupancy lanes being strictly enforced, drivers had to abide by the HOV-4 rule (later changed to HOV-3) or pay stiff fines. When a driver did not have enough passengers for the HOV, he would pull up to a line of commuters waiting for the bus and offer a ride to anybody in the line. Faced with waiting in the summer heat or winter cold for a bus that could be late or full to capacity, some commuters began opting for the car. Soon word began to spread as drivers found an easy solution to meeting the HOV requirements, and bus riders found a faster, cheaper alternative to the bus. I’m sure it took some time for the word to spread, but soon enough people knew which bus stops catered to the offers of free rides. It is believed that slugging began with people waiting at bus stops on their way to the Pentagon (which was—and still—is a major transportation hub). According to a study by the Urban Institute in 1989, slugging existed in only one location in Springfield, VA. That doesn’t mean slugging began in 1989, only that when the study was conducted, formal slug lines already existed. Since I have interviewed people who have slugged from the Springfield area since 1982, we know that slugging predates the Urban Institute study with evidence that slugging began in the early 1970’s. Nevertheless, the Urban Institute did recognize that a "formal" slug line was in operation at a place known as "Bob’s," which referred to a line adjacent to Bob’s Big Boy restaurant at the intersection of Bland Street and Old Keene Mill Road in Springfield. As it turned out, Bob’s had all the ingredients normally needed for a slug line: parking, a bus stop (or other mass transit), and easy access to the HOV. Because the Pentagon was—and still is—a major commuter hub, Bob’s line had the Pentagon as its only destination. Today, some 30 years later, Bob’s has undergone a number of changes. The Big Boy restaurant has been replaced by Shoney’s, and the slug line no longer services the Pentagon but has been replaced with two lines: one for L’Enfant Plaza and the other for the Memorial Bridge area. Furthermore, the lines themselves have moved across the street next to Long John Silver’s. So, if Bob’s is next to Long John Silver’s, why is it still called "Bob’s"? Either out of respect for tradition, or simply because the name just stuck, the name "Bob’s" has endured the test of time. Where Did the Word "Slug" Come From? The term "slug" itself did not derive from the word that means mollusk, as some people think. Instead, the term appears to have originated from bus drivers as a derogatory term. The story goes like this. Bus drivers had always been warned to be aware of counterfeit coins (also known as slugs) from people trying to pass off this fake money in the coin collection tray. When slugging was in its infancy, commuters stood at the bus stops, waiting for a driver to pick them up. Bus drivers, thinking these people were waiting for the bus would stop to pick up the passengers only to be waved off, frustrating many of the drivers. As this event became more and more frequent, bus drivers began recognizing the real bus riders from the fakes. Because the people weren’t really waiting for the bus, drivers began to simply call them "slugs." This definition seems to make sense because these people weren’t real bus riders or even real car poolers in the usual sense of the word. They were, just as the name implies, counterfeit riders or slugs. Hence, the term was born. Over time, the less-attractive term "slug" has had many contenders, such as "instant carpooler," "hitchhike commuter," and "casual carpooler," but tradition has continued to outlive the newer, more politically correct terms.